While Syd Arthur’s music may not be the most ground-breaking on the market, it undoubtedly modernizes a sound that is all too often prone to showing its age. The four band members, in spite of their obvious youth, have been together since 2006, and have already accumulated enough experience to set up their own recording studio and independent label (named Dawn Chorus Recording Company). Their recording debut, the EP Moving World, was released in 2010, followed by the single “Ode to the Summer” in the following year, and finally by On And On in the summer of 2012. Like most progressive bands that shun the “prog” tag, they also have an impressive record of live performances in the UK and in other European countries. Interestingly, violinist Raven Bush is the son of writer and photographer John Carder Bush, Kate Bush’s elder brother, and – though Syd Arthur’s music as a whole might not immediately recall Kate’s – some similarities can be noticed, especially in terms of approach to the traditional song format. Clocking in at a mere 38 minutes, On And On is a short album, and – with the sole exception of closer “Paradise Lost”, its songs are also short (3 minutes on average). 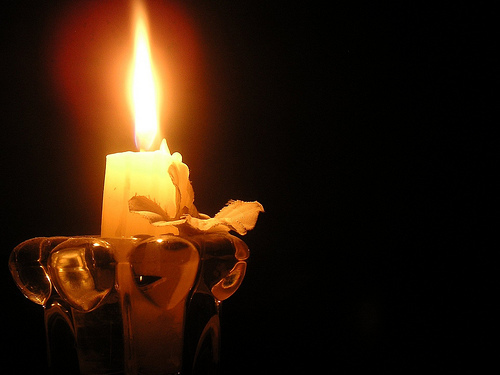 However, the traditional verse-chorus-verse structure is often cleverly disguised or understated, and the appeal of the melodies is never made too obvious. Opener “First Difference” blends the airy lyricism of the violin and acoustic guitar with the slight edge injected by the electric guitar, and a hint of reggae in the song’s easy mid-pace. Liam Magill’s voice follows the musical line, never dominating the instruments though not taking a back seat either. The following two songs are variations on the same theme, but with enough personality of their own to stand individually – the changes in pacing within each piece handled with subtlety, allowing the music to flow naturally without ever sounding strained or contrived. At the end of February 2012, Mahogany Frog played two dates in the Brazilian metropolis of São Paulo – one of the largest cities in the world, and the birthplace of Formula One driver Ayrton Senna, who died in a tragic accident in 1994. The sixth album of the Canadian quartet is dedicated to this legendary figure, who enjoys the status of national hero in his native country. Based in Winnipeg (Manitoba), and named after an amphibian from south-east Asia, Mahogany Frog have been together since the late Nineties, and released six albums with different lineups – founders Jesse Warkentin and Graham Epp being the only constant members of the band. Senna, released in September 2012 by New York label Moonjune Records, comes four years after DO5, their first album for Moonjune. Besides their recording activity, Mahogany Frog are quite busy on the live front, gigging regularly in Canada and occasionally elsewhere: in 2010 they were invited to perform at the 16th edition of ProgDay, and wowed the crowd with their unique brand of wildly eclectic instrumental progressive rock. Before Senna’s release, Mahogany Frog had undergone another lineup change, as drummer Jean-Paul Perron (who had been with the band since its inception) was replaced with Andy Rudolph, an electronic performance artist whose expertise with drum machines as well as a traditional kit adds a keen contemporary edge to the jazz-tinged, psychedelic wall of sound produced by the band. With all members possessing multi-instrumentalist skills, and switching effortlessly from keyboards (both analog and digital) to guitars and all sorts of cutting-edge electronic gadgets, Mahogany Frog’s music is at the same time cheerfully chaotic and sharply energizing – a collection of soundscapes that throw together a multitude of influences with wild abandon and unabashed eclecticism, but also with a method to its madness. Not surprisingly, the band have managed to land concert opportunities that most prog bands can only dream of – and that in spite of the often counterproductive “progressive rock” tag. While paying homage to Seventies trailblazers such as Soft Machine and early Pink Floyd, Mahogany Frog also embrace modern trends such as post-rock and even techno and trip-hop, seasoning the heady brew of their sound with the ambient-like flavour of field recordings of birds and whales. The juxtaposition of organic warmth and state-of-the-art technology is revealed right from the intro of “Houndstooth Pt 1”, suggesting the sound of an engine being started (in keeping with the album’s title and cover artwork). The solemn drone of the organ evokes Pink Floyd circa A Saucerful of Secrets, and the mix of piercing slide guitar, rugged riffing and wacky electronic effects rivets the attention. “Houndstooth Pt 2” pushes distorted, almost Hendrixian guitar chords to the fore with a strong space-rock matrix, mingled with an atmospheric surge propelled by Andy Rudolph’s authoritative drumming. The compact, dense riffing and whistling synth in “Expo ‘67” are tempered by organ sweeps redolent of The Doors and a clear, sharp guitar solo; while bucolic birdsong introduces the lively, dance-like pace of “Flossing With Buddha”, in which layers of keyboards are bolstered by Andy Rudolph’s powerful drums. The second half of the album opens with the sparse texture of “Message From Uncle Stan: Grey Shirt” (the longest track on the album), resting on strident, almost industrial sound effects, but soon evolving into an exhilarating guitar duel, backed by assertive organ and clearly inspired by Ennio Morricone’s iconic style. The shorter “Message From Uncle Stan: Green House” starts out slowly with a faintly ominous, spacey drone, then the organ signals a sudden, crescendo-like change of pace. Then, after the brief respite of the airy, electronic mood piece of “Saffron Myst”, chaos erupts with “Aqua Love Ice Cream Delivery Service”, where buzzing feedback and metal-tinged riffing coexist with a field recording of whales, as well as an unexpected harpsichord finale with an elegant, almost classical lilt. 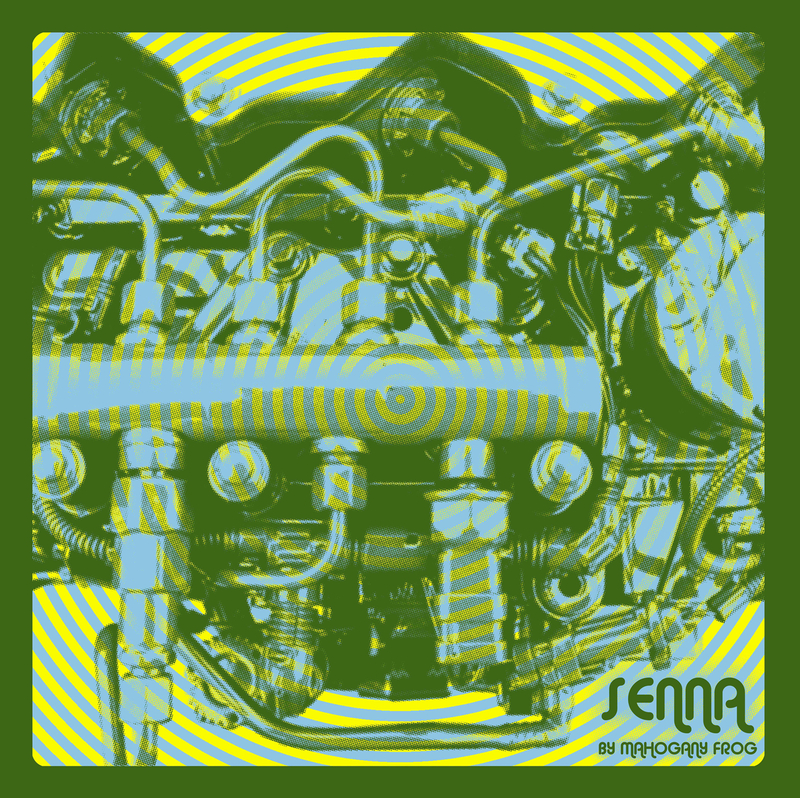 Clocking in at a very restrained 43 minutes, with only one of the 8 tracks exceeding the 8-minute mark, Senna makes the most of its highly concentrated musical content, striking a nearly perfect balance between inventiveness and sheer energy – a rare achievement even for an all-instrumental album. It also shows a band at the top of their game, whose expressive power seems to have been honed by their four-year break between albums. Indeed, Mahogany Frog deliver the kind of music that has the potential to appeal to a large cross-section of the non-mainstream audience – not just dyed-in-the-wool prog fans, but also those who actually believe in the original meaning of that pesky “progressive” word. A highly recommended album, Senna is definitely one of the most consistently strong releases of the year. Formed in 2004 by guitarist Fred Laird (also behind the project Moon of Ostara, whose debut album was released in May 2012), Earthling Society hail from Lancashire, in north-western England, and the rich body of history and folklore of this region has offered plenty of intriguing subject matter for the band’s 6 albums (released in almost as many years of activity, with Laird and drummer Jon Blacow the only constant members). 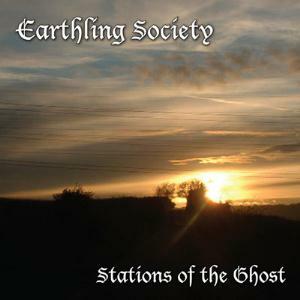 Stations of the Ghost, Earthling Society’s sixth studio album, is a concept of sorts, inspired by the writings of Welsh author and mystic Arthur Machen (whose novella The Great God Pan was highly praised by HP Lovecraft), and dealing with the band’s favourite topics of paganism and the occult. Clocking in at a well-balanced 57 minutes, the album features 7 tracks of varying length, from the 2 minutes of the evocative title-track (strategically located at the opening of the album) to the 13-14 minutes of “Child of the Harvest” and “Night of the Scarecrow”. Unlike jam-oriented bands such as Öresund Space Collective, Earthling Society write compositions that are obviously structured, though not in the painstakingly detailed way of the average prog band. 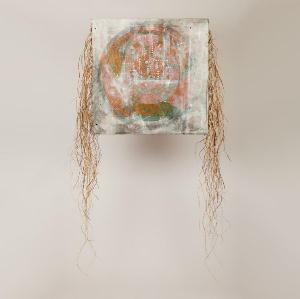 Even when the running time exceeds 10 minutes, none of the tracks come across as sprawling or unscripted, and their occasionally regular, hypnotic texture is nicely offset by subtle but unmistakable changes in tempo and mood. Fred Laird’s vocals, which appear on the three longest tracks, are pushed into the background rather than to the forefront, with an almost opaque effect that renders the lyrics nearly unintelligible, increasing the music’s mysterious allure; while the combination of eerily beautiful chanting, buzzy sound effects, tolling bells and recorded voices, creates an intensely cinematic atmosphere. As is the case with the majority of psychedelic/space rock bands, the influence of early Pink Floyd is never too far, and the first half of the 9-minute “The Last Hurrah” may bring to mind Syd Barrett’s unique contribution to the legendary English outfit, with gentle acoustic guitar and tambourine overlaid by echoing electric guitar, and Fred Laird’s oddly filtered vocals conjuring a hauntingly mellow late Sixties mood; while the second half of the song gets a robust injection of energy from the whistling synth and electric guitar before reverting to the initial theme. Keyboards are used more as an accent, for textural purposes, than as the main event as in symphonic prog. Rather than shine in solo spots, they provide eerie, haunting washes of sound that bolster Laird’s guitar exertions, or the usual array of weird sound effects that are part and parcel of the psyche/space rock subgenre. However, in “Dark Horizons” the keyboards play more of a starring role, with Laird’s contribution supplemented by Joe Orban, and electric piano and Hammond organ adding their distinctive voices in contrast with the rawer, riffy guitar sound. The two “epics”, while similar in terms of running time, are quite different in conception and structure. While “Child of the Harvest”, with its many twists and turns, riveting quiet-loud dynamics and wistful saxophone (courtesy of guest Ian Wright) tempering the harshness of the distorted guitar, is the most likely to appeal to traditional prog fans, the decidedly heavy “Night of the Scarecrow” veers into stoner rock territory, propelled by Laird’s unleashed guitar work peppered by chanting and howling; the final section of the song, with its sitar-like steel guitar and Eastern-tinged mood, made me think of Amon Düül II. The steady, hypnotic surge of the highly cinematic instrumental “The Halloween Tree” is also pure Krautrock, while album closer “Lola Daydream”, driven by ever-changing guitar over a slow, measured rhythm, reprises the vintage Pink Floyd vibe of the opener. Rooted in the Seventies, yet with enough of a modern attitude to avoid overt nostalgia, Stations of the Ghost has a potentially broad appeal, Even though built on atmosphere rather than technical skill, and therefore lacking in the pyrotechnic displays that many progressive rock fans appreciate, it nonetheless manages to balance rawness and delicacy in quite a remarkable way. The beautiful, haunting cover – suggestive of pagan rituals at summer solstice – provides a fitting complement to a very intriguing album.